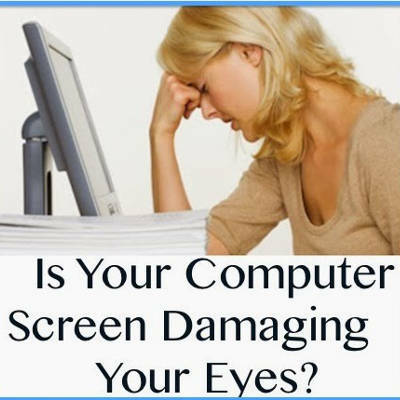 Is Your Computer Screen Damaging Your Eyes? In today’s world many of us spend 10-12 hours of our day in front of glowing computer screens. Computers are used for doing almost everything, they improve productivity by making complex calculations simple, but have your wondered if staring at the screen for long periods of time can significantly damage your eyes? When we look at the computer screens for long periods it can cause pain and strain to your eyes which in some cases may become Computer Vision Syndrome (CVS). CVS is not a single specific eye disorder, its a group of eye-related problems including strain ad pain in eyes. Statistics show between 50-90% of computer users experience some kind of eye problem. Working adults are not the only ones who are prone to this problem. Kids who play video games on computers, especially games that require high concentration, are liked to experience eye-related problems. Research shows people who use computers a lot have little to no difficulty focusing on things near to them, however far sight becomes blurry. The most common symptoms of CVS are redness in eyes, irritation or dryness, burning sensation in the eyes, double or blurred vision, shoulder and neck pain, and headache. Latest Headlines » Eye Health » Is Your Computer Screen Damaging Your Eyes?